Splendid Dutch Golden Age map of the historical County of Namur in Belgium. Latin descriptive text on verso. Original hand-colour. "neither mountainous nor plain, but raises here and there up to small hills and sinks down to valleys. The woods, of which the largest is called Martelange, yield plenty of game for gentlemen. It abounds with things necessary for a man's life." The map's geographic source is an unpublished manuscript map of Luxembourg by Jacques Surhon from 1555. 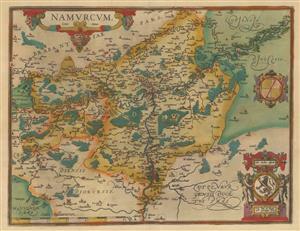 Ortelius credits Surhon above the crest of Namur in the lower-right corner of the map.